This past weekend my husband mentioned the blog "firestorm" gaining ground regarding the new book by Rob Bell Love Wins. It won't be releasing until late March, but already verbal punchs are being thrown, sides are being taken and heretics branded. Zondervan opted not to publish the book so HarperOne is carrying it. Explosive, controversial, divisive...Should House of James sell Love Wins? Is Rob Bell a universalist? Are you going to read it? John Piper, Tim Challies, Josh Harris, and Kevin DeYoung (among others) have all weighed in with strong opinions of Rob Bell and his theology but the consensus seems to be wait and see. Read the book first so that we are not jumping to conclusions based on tantalizing and effective (!) marketing by the publisher. I am personally planning to read Love Wins and I am glad that we will be selling it here at the store. If we want to speak authoritatively about a subject, we had better have our facts in order. I don't want to form my opinions based solely on the generalizations of others about such a crucial topic. This issue calls for first-hand knowledge. Take a look at the following video by Rob Bell himself. Ever since grade one, when my teacher told me that "t" says "tuh" and "h" says "huh" and "th" says "thuh", I have loved books and reading. Twice in my life I have been in a geographical place that did not have easy access to books. I thought my heart was going to stop. 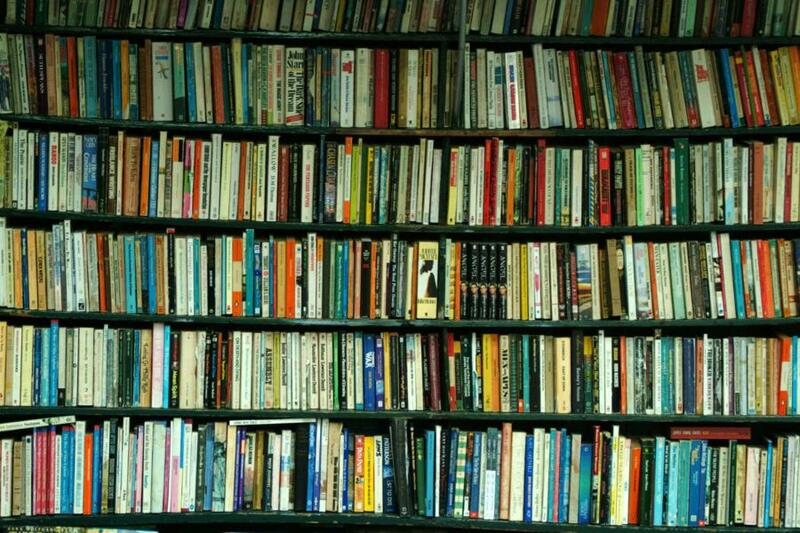 How can there be anywhere in the world that does not have books? Horrid thought. Imagine not being able to physically hold a cookbook, a Bible, a spy novel, a board-book for your toddler. Imagine that libraries were only open between 1:00-3:00 on Thursdays. Imagine your local bookstore closing for renovations and re-opening as say, a tree nursery or a car dealership. Imagine waiting at the airport without a book to while away the hours. Imagine the sun sending out a blip that rendered on-line access to books impossible. Imagine being dependent on electricity to read a book. Imagine a holiday without a book on the table beside your iced tea. Imagine a living room beautifully furnished with comfy chairs, a persian rug, a murmuring fireplace and empty bookshelves. Okay, okay, I know, the pictures I'm conjuring up are ugly and untenable. Why then, did the huge, highly successful bookstore chain Borders just declare bankruptcy? Why are bookstores all over Canada and the U.S. closing their doors? I read a book years ago called The Yellow-Lighted Bookshop by Lewis Buzbee and loved it. When a bookstore opens its doors, the rest of the world enters too, the day’s weather and the day’s news, the streams of customers, and of course the boxes of books and the many other worlds they contain—books of facts and truths, books newly written and those first read centuries before, books of great relevance and of absolute banality. Standing in the middle of this confluence, I can’t help but feel the possibility of the universe unfolding a little, once upon a time. I don't wish to sound maudlin, but books are just so fundamental to society's health. The author and the reader connect and travel together down a new road. Imaginations are stirred, opinions aired, ideas inspired. The books I've read have changed my life. How else would I have learned the concept of boundaries? how to cook? how to really love my children? the joys of opening my home to hurting people? How else would I have endured those lonely hours in the jungles of Borneo? How would I know God's message of love, forgiveness, redemption, grace? How would I learn the stories of my fellow human beings - heroes who have overcome torture, grief, despair, unimaginable odds with grace and courage? How could I possibly have been the sole medical aid for 200 people with only one day of nurse's training? For years, the book Where There is No Doctor occupied pride of place on my desk together with my Bible. There was a great article on CNN a couple of days ago about the efforts in Africa to get young women reading. Nigerian publishers and authors are collaborating on books by and for Africans. That encouraged me, as does every customer who walks through our front doors and says, "Oh how I love the House of James!" A young man told me the other day, "Abbotsford wouldn't be Abbotsford without House of James!" Long may we live! my husband asked me to marry him. Well, to be precise, he asked me the day before on Feb 13 so that we could spend Valentine's Day in an engaged state. We were married 3 months later. We only had two dates, although I did spend a week with his family the previous Christmas, but that was only as "prayer partners"! We had no pre-marital counselling although we did read a few books about s - e - x beforehand. We had vastly different backgrounds although we both had praying parents. I was a city girl, he was an m.k. (missionary kid) from the jungle. We are both head-strong firstborns. We spent our first anniversary looking after a missionary guesthouse in Borneo and lived in Indonesia for the next 16 years of our married lives. Our kids look at us and marvel. "We can't believe you made it!" Five Love Languages by Gary Chapman Did you know that this was even recommended on The View? It truly is that good. Don't get all bogged down with its simplicity. Just read it and take it at face value. You really do have a "language" that you use to show and receive love and care. I simply could not understand why my husband didn't fully appreciate all the shirts I ironed for him! Sure he was glad to see them all lined up neatly in his closet, but what he REALLY wanted was my company! And I certainly could not grasp why he thought I wanted jewelry. What I REALLY wanted was for him to tell me how beautifully I baked bread, how nice those ironed shirts looked, how clever I was at Indonesian. Words of affirmation are SUPER important to me. For many years we muddled along and we are still learning to use the correct language with each other, but at least we now know why we experienced so many unmet expectations. I have a stack of wonderful books about marriage here on my desk and I'm mad that I don't have more time to sing their praises. All I can do is to tell you their titles and hope that you will find them helpful. They have all been read either by me or other trustable people. I am crazy about a new book that just showed up in the devotional section. Our boss, Lando, pulled it off the shelf a few days ago to read during the staff prayer time and it has not disappointed yet. The Book Lover's Devotional is the title and inside we "learn about life from sixty great works of literature". Today's reading was based on Lucy Maud Montgomery's Anne of Green Gables. Did you know that Anne has sold over 50 million copies since its publication in 1908? Anne happens to be a personal favorite of mine, (after Pippi Longstocking), and for years I have tried to emulate her love for life, for words, and for her family. In fact, at one point I was so obsessed with her that a godly, older lady told me to get my eyes off of Anne and onto Jesus! There is a somewhat ironic scene near the beginning of the story in which Matthew Cuthbert, the owner of Green Gables, a farm in the town of Avonlea, on Prince Edward Island, goes to the train station to pick up an orphan child that he believes to be a boy. He and his sister Marilla have decided to take the boy, because Matthew is growing old and needs help with the chores at Green Gables. Imagine his surprise when he finds Anne, a darling little chatterbox with red hair waiting there. He takes her back home to meet Marilla. Unfortunately, Marilla - who is rather stoic in personality - doesn't take to the child. Anne is everything Marilla is not: quirky and fun, and often into mischief. In spite of her challenges, Anne maintains a hopeful view of life. She's convinced that God's in His heaven, all's right with the world. All of this is made possible because two people extend a hand to her, offering love and hope in her time of need. Our journey is much like Anne's. We come to God broken, without a home, lost, and unsure of where we fit in. He fathers us, caring for our deepest needs and offering a safe place to run. Then, as we are healed and made whole, He teaches us to do the same for others - to extend a hand to those in need.